To improve the performance of melamine–formaldehyde (MF) aerogel, boron nitride nanosheets (BNNs) were doped in it to get a new aerogel. The aerogel was prepared as a coating, and basalt fibers modified with it were filled in a polyetheretherketone tube for in-tube solid-phase microextraction. Its morphological structure was characterized by scanning electron microscopy. 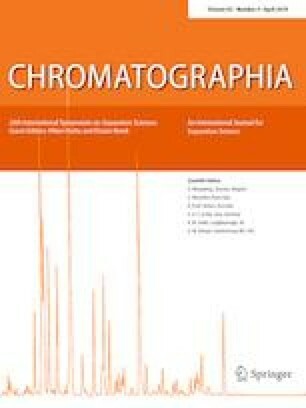 Connected with high performance liquid chromatography, it was investigated with several polycyclic aromatic hydrocarbons (PAHs) as model analytes. An online analytical method was established under the optimized conditions, including extraction volume, extraction flow rate, methanol content in sampling solution and desorption time. The method had wide linear ranges (0.016–15 µg L−1, 0.016–20 µg L−1, 0.030–20 µg L−1), satisfactory correlation coefficients (0.9968–0.9997) and low limits of detection (0.005–0.010 µg L−1). The relative standard deviations (RSDs, n = 3) of the method were in the ranges of 0.5–6.1% (intra-day) and 2.2–8.8% (inter-day). RSDs of preparation repeatability among three tubes ranged from 0.4 to 2.9%. Compared with MF aerogel coating and other materials, BNNs-doped MF aerogel showed better limits of detection, higher enrichment factors (1015–1846) and comparable extraction time, due to large specific surface area and π–π interaction with PAHs. The method was applied to detect PAHs in rainwater and a soil solution. Published in the topical collection Recent Trends in Solid-Phase Extraction for Environmental, Food and Biological Sample Preparation with guest editors Anna Laura Capriotti, Giorgia La Barbera, and Susy Piovesana. The online version of this article ( https://doi.org/10.1007/s10337-019-03707-y) contains supplementary material, which is available to authorized users. This research work was financially supported by the National Natural Science Foundation of China (NSFC, No. 21777054) and the Shandong Provincial Natural Science Foundation of China (No. ZR2017MB043). This article does not contain any studies with human participants or animals performed by the authors.